I almost read it involving a random choice. 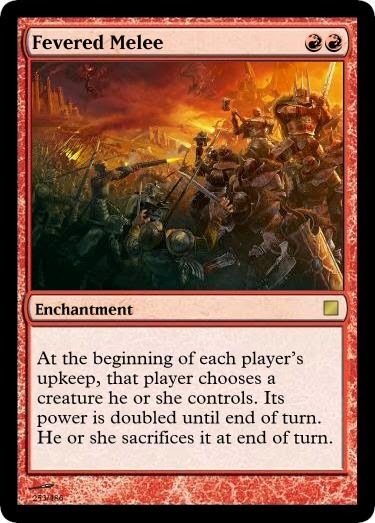 I think I project that onto red rare enchantments. A boost for your aggro creatures, or an abyss for control, nice. 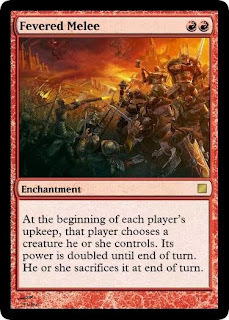 If you're using this in a creature-less deck to abyss your opponent you're going to take a ton of damage in the process, but I still feel like this should either be a creature or have a self-destruct clause when there are no creatures left. Ooh. I very much like the idea. I'm worried "sacrifice a creature every turn" may be too abusable? I'm surprised at how balanced this seems at RR. Not often you find cheap red global enchantments!